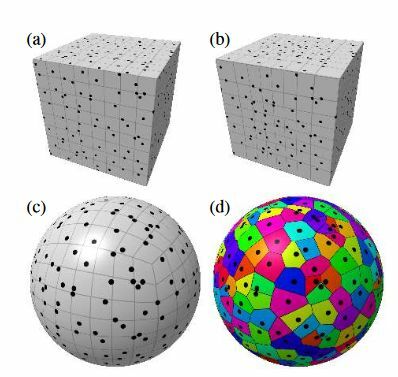 Motivated by efficient GPU procedural texturing of the sphere, we describe several approximately equal-area cube-to-sphere projections. The projections not only provide low-distortion UV mapping, but also enable efficient generation of jittered point sets with O(1) nearest neighbor lookup. We provide GLSL implementations of the projections, with several real-time procedural texturing examples. Our numerical results summarize the various methods’ ability to preserve projected areas as well as their performance on both integrated and discrete GPUs. More broadly, the overall cube-to-sphere approach provides an underexplored avenue for adopting existing 2D grid-based methods to the sphere. As an example, we showcase fast Poisson disk sampling.